From the former Editor-in-Chief of The New Republic, a scathing critique of Big Tech culture, breaking down the collective history and impact of giant corporations such as Amazon, Facebook, and Google. The lives of Amazon's Jeff Bezos, Facebook's Mark Zuckerberg, and Google's Larry Page and Sergey Brin leap from the pages of World Without Mind, as Foer conjures concise, insightful psychological profiles of each mover-and-shaker, detailing how they've mixed utopianism and monopolism into an insidious whole ... even at his most persuasive, Foer doesn't pay enough attention to how activism might counter what he calls the tech industry's aspiration 'to mold humanity into their desired image of it' ... A threshold is about to be crossed, he says, if it hasn't already — and beyond that, it will become nearly impossible for us to extricate ourselves from a life where social media and centralized information have eradicated privacy, individuality, and free will. Naturally, George Orwell enters the conversation. But even at his most sensational, Foer modulates his hyperbole into the kind of lucid, absorbing exposition he fought to preserve while at The New Republic ... Foer has not presented a coolly considered and calmly debated case of persuasion; rather, World Without Mind is a searing take, a polemic packed with urgency and desperation that, for all its erudition and eloquence, is not afraid to roll up its sleeves and make things personal. [Foer] has crafted an anti-Silicon Valley manifesto that while occasionally slipping into alarmism and get-off-my-lawn-ism makes a cogently scary case against the influence of U.S. tech firms (but not, crucially, technology itself). Silicon Valley, he argues, may say it wants to improve the world. But its true endgame is the advancement of an ideological agenda.? And it's a terrifying one ... Foer also has a knack for finding the aptly revealing quote from a Silicon Valley executive; this is a book interested in petard-hoisting. World Without Mind becomes a little too preoccupied with journalism and creativity, particularly in its latter sections. The effect of certain technology on media can be profound and frightening. But it is hardly the sum of the changes the digital world has wrought ... Some may also find his unifying theories? a little too grand...But he mostly and persistently, with the zealotry of the companies he derides, builds a strong philosophical case. ...[a] thought-provoking and cogent book ... World Without Mind argues that we must actively fashion the internet we want instead of accepting, by default, what markets give us...It would take quite a shift to bring about the changes Foer advocates. He thinks it’s most likely to occur only after enormous and damaging hacks, the kind that disclose enough private information to wreck lives, or disrupt systems in ways that cause death and destruction. In an environment where we are being governed by the Tweet, but can at least vent our outrage on, well, Twitter…I fear even this sad prediction may be overly optimistic. 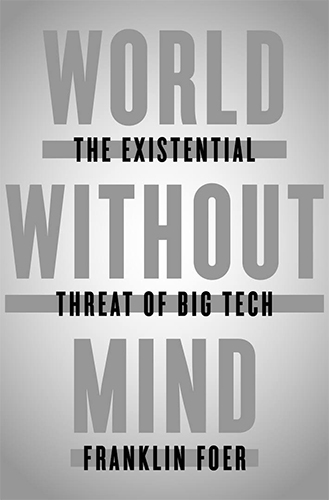 What did you think of World Without Mind: The Existential Threat of Big Tech?